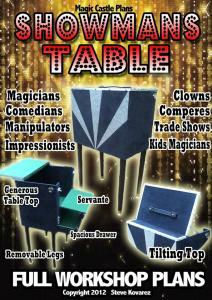 The table designed for ALL entertainers and magicians alike. It features a large internal well, a rear servant area, a full width drawer and a generous table top area. 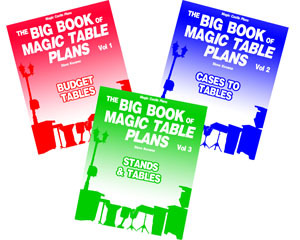 Perfect for acts in all situations...from cruising to street busking.....this is a pro's table for all occasions. full dimensions and step by step photos. 15 ideas and designs with measurements and photos of actual built designs all tried and tested that are cheap to build for those on a tight budget. 1. Column Case Table, 2. 2/3rds Case Table, 3. 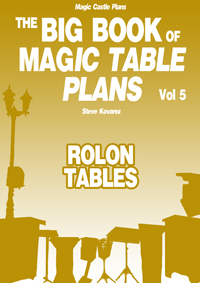 Kovarez Cabaret Table, 4. Kovarez Cabaret Table Version 2, 5. TV Box to table, 6. Cube Table, 7. Clipped Case Table. 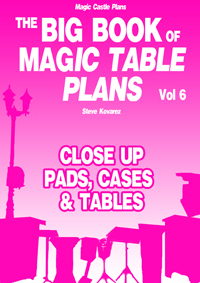 Apologies for the delay in Vol 6 - its coming soon !